Ivan says he's got time to help this weekend (he has a newborn at his house, so I haven't been bugging him to pitch in lately). Left to do: make the mechanical emergency disconnect, mount & hook up the 2nd contactor, ammeter shunt, fuse, tidy up some small wiring (incl. getting rid of the parts of the original ICE harness that are still hanging around the motor compartment). I'm thinking it's not unreasonable that I might have it to my mechanic at the end of next week, or the beginning of the following week. Hmm, Ben, that would make me late again, since a week Monday is October 1st. Looks like we'll be just in time for the approaching cold weather in an unheated EV with decreasing floodie performance! SVOboy says: You're crazy, you know that? Oh, and re: controller failures - I was talking to someone last week who made an electric outboard (DC with lithium) and experienced controller failure (overheated it) ... it failed fully on. The pic doesn't really show how 3-D is is. It's a 3-point mount: 2 on the firewall, and 1 on the strut tower. And it had to go around/avoid a bunch of stuff, and sit fairly close over the transaxle. Here it is with the component platform finally attached. Soon the remaining bits 'n' pieces will be attached to the piece of lexan. Today's task was making up brackets & a tray which will hold 3 used 12v 7AH alarm system batts which will make up the 12v accessory power. The plastic used for the tray was the top of a used 45 gallon barrel (cut the top off to make a rain barrel). Heated it in the oven to make it pliable, then formed the edges. Not a very professional result. Yes it's fugly, but it works, so it will stay. 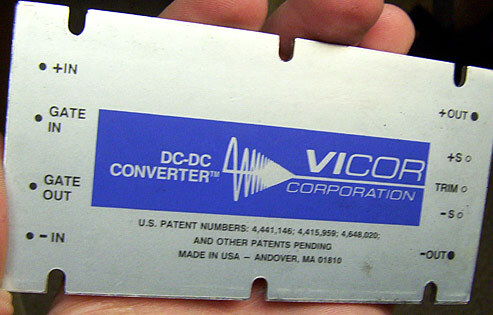 I'm also actively shopping for a DC-DC converter. Seems like there's 48v stuff available for $20-30 including shipping. We'll need one to keep the relatively small 12v batts alive under heavy loads (lights/wipers etc). $25, incl. shipping via "best offer" bid. I took the car in to the mechanic today for a pre-inspection inspection. No, it's not ready yet (e.g. I still have to mount components on the platform & make new motor cables). But I figured he was going to find something else he didn't like, so I was going have to make two trips anyway. The only unexpected request from him was putting a rubber strip under the piece of angle iron that holds down the batteries in their racks - to prevent wear from vibration to the batt cases. I also realized it'll also avoid conducting "surface charge" from the top of one batt to the next. And he liked that reason too! It was a fun trip. The guy is really excited about the car - he thinks it's pretty cool. They were busy when I rolled in (it's a 6 bay place), but the boss and 2 of his mechanics stood around looking under the hood & asking questions for ten minutes or so. I've got to work on my answers - I'm probably reinforcing the stereotypical impression that EV's are necessarily weak & slow. I need to remember the disclaimer - e.g. emphasize puny golf cart controller, forklift motor & worn out batteries! I told him I'd have it back in early next week for the real inspection. Yup, late again! "Over promise and under-deliver" is the Project ForkenSwift motto! spent most of my tinkering time Saturday adjusting the motor brush timing... again. I was reading up on the pile of EVDL messages ripening in my inbox, and came across a message from motor guru Husted about low voltage systems & brush advance. Noted that he said "5 degrees for mild" voltages. Apparently the common "10 degrees for street use" applies to higher voltages (say 120+). So I went out and measured... and the brushes were advanced almost 17 degrees!! Whoops. For 48v he suggested putting them to neutral. I now have them near 2 or 3 degrees advanced. According to Jim, the closer to neutral timing = more low end torque and less top end RPM. The motor should run more efficiently too. After making the adjustment (drilled a new set of adjustment holes in the end cap ... with the motor still in the car), I can vouch for the first 2 statements. The car goes up hills better (relatively speaking), but I can no longer wind it out to 4000 rpm before shifting - it just runs out of steam. And it still won't spin the tires on gravel, before or after the adjustment. I tried. BTW, although controller failures are uncommon, they do happen. I've seen an example of an early model Altrax controller that failed while coupled to an Etek. The MOSFETs shorted which = full power from the batteries to the motor. Also someone on another EV forum I'm a member of was injured when their controller failed WOT and they crashed. A neat place for your second/disconnect contactor would be wired into the brake circuit. What happens when things go bad? You go for the brakes! My EVT 168 electric scooter has a brake cutout where if the brakes are activated while the throttle is open the controller cuts out and doesn't restore power for two seconds after the brake is released. On the issue of DIY soldered cable ends... I'm discovering they're not that much cheaper than lugs. I've used 1.5 baby tanks of acetyline & a roll of solder @ $47 total. So far I've made about 22 ends. So each one cost about $2, not including my time (I've got it down to about 5 minutes each, but the average is certainly way higher). Maybe I'm just paying too much for acetylene? Brake circuit contactor relay... Yeah, my mom's e-bike has the same safety feature (controller cuts out if either brake lever is pulled). I thought about using the brake circuit, but if releasing the throttle fails to remedy the full-on controller situation in the first place (ie. the contactor welds), then attempting to release a second contactor (of the same rating) via the brake light circuit will likely have the same result. Besides, for people who have always driven stick, jamming down both the brake AND the clutch simultaneously in a panic stop situation is an automatic response (pardon the pun). So the mechanical disconnect on the end of the clutch cable should do the job. The 300A main fuse & accelerator contactor are mounted on the component panel and nearly all hooked up. Pretty much all that's left to do is make one more short cable, secure said cable and several others with straps, and mount the controller precharge resistor (a spotlight scavenged from the forklift). I should be able to get this stuff done tomorrow. So I'm going to call and schedule the inspection. Here's hoping he can fit me in before the weekend.